Alumni from the 1956 – 1978 Stan Kenton Orchestras come together to perform for festivals, clinics, concerts, cruises and dances. The band makes tours around the United States every year. We perform some of the well-known music of the Stan Kenton Orchestra; plus in keeping with Stan’s insistence on not just performing nostalgia type music, we also perform fresh new material written in the Kenton style, as well as original material written by members of the Band. We are NOT trying to be the “Stan Kenton Orchestra,” but we are carrying on his tradition of dedication to creative music and to jazz education. We have the blessing of Leslie Kenton, Stan’s eldest daughter, who represents the interests of her father. She approves of all we are doing with the band to keep the Kenton Legacy alive. Leader Mike Vax is a product of the City of Oakland, CA, and the Oakland Public Schools, having graduated from Oakland High School in 1960. He has led a big band off and on since his days at College of the Pacific over 45 years ago. A few of his credits include being first trumpet, soloist and road manager of the Stan Kenton Orchestra, as well as being co-leader while Mr. Kenton was recovering from surgery; leading the Dukes of Dixieland in New Orleans; producing and/or music directing for over 40 jazz festivals; and performing workshops for more than 2500 high schools, colleges and universities all over the world. He is an International Artist for the GETZEN COMPANY. Mike now lives in Northern Arizona and still travels on the road many months a year. The goals of the band are to perform meaningful music, talk about the importance of the jazz heritage in America, bring jazz music to young people, and to offer our audiences a relaxed, entertaining atmosphere. 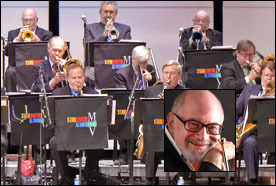 FRIENDS OF BIG BAND JAZZ is the support group for The Mike Vax Jazz Orchestra and the Stan Kenton Alumni Band. This nonprofit corporation sends students to summer jazz camps on scholarships, donates funds to high school music programs and youth orchestras, and raises money for many good causes that have to do with music and education.